Welcome to our Ischia blog, Good Morning Ischia! Here you can see the entry for Thursday 26th December 2013. How are you all today? Did you have a good Christmas? It's not over yet obviously as today is Boxing Day but known in Italy as "Santo Stefano" (The feast of Saint Stephen) and marked with a national public holiday. The weather today is a distinct change from yesterday as we wake to heavy rain and wind as our unseasonal spring-like conditions seem to have come to an end. Looking out to sea the waves are creating big white swirls of frothy foam and it's set to stay like this for the rest of today. The outlook for the next few days is a lot more promising though with today's storm set to die out within 24 hours or so. Temperatures today should be a maximum of 17° Celcius (63° fahrenheit) and a minimum of 12°C (54°F) although with the wind-factor I think you should probably wrap up warm and certainly dry. As mentioned above, today is Santo Stefano in Italy and most people have a day off work. The day is usually spent visiting friends or family and just generally relaxing after the previous day's celebrations. We all know about the legendary Italian cuisine and the food I was lucky enough to enjoy yesterday was beautifully prepared and came in very large quantities, so much so that after yesterday's lunch I was unable to even think about having anything for dinner! Coming from the U.K. my traditional Christmas dinner usually consists of roast turkey and all the trimmings followed by Christmas pudding which will always be missed but yesterday's fare was equally delicious with a wide range of vegetables including pumpkins, aubergines, cauliflower, artichokes and more. There were several meat dishes including beef, chicken and pork, cheeses including buffalo mozzarella shaped into snowmen, pasta, a savoury panettone with tuna, followed by home-made biscuits, profiteroles chocolates and sweets, in fact having typed all that and realising just how much I really did eat I think I might have to skip breakfast as well! Central to yesterday's entertainment was the Italian, or I should say Neopolitan version of bingo known as "Tombola". Over the next few days I'll write a full blog about Tombola with photos as it's a lot of fun and includes some hilarious images for each number, some of which have to be seen to be believed! 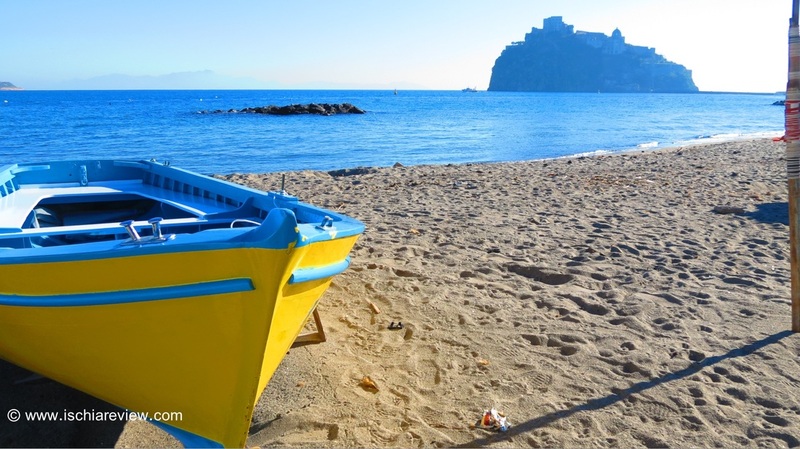 Today's photo comes from Ischia Ponte and Fisherman's Beach (Spiaggia dei Pescatori), the bright yellow boat shown being one of dozens that are used by the local fishermen who live around the area and use the beach as their base for their nocturnal raids. The beach lies between Ischia Ponte and Ischia Porto and is one of the nicest places on the island to take a stroll. In fact a stroll sounds like the perfect idea for my next activity to see if I can work off some of the excesses of yesterday and build up a bit of an appetite for lunchtime! That's all for this morning anyway, have a great day wherever you are and thank you all again for your Christmas wishes. I'll be back with more tomorrow morning.